It’s really important that young people are educated about racism and that everyone should be treated equally no matter what their ethnicity. There is no place for racism in any walk of life and events such as today’s only reiterate this. On Thursday 8th December, Show Racism the Red Card (SRtRC) held an educational event at Anfield in partnership with Liverpool FC. More than 120 young people from local primary schools attended the event which saw the Year 5/6’s take part in a SRtRC workshop, watch the SRtRC educational film and were involved in a Q&A with a panel of special guests. Pupils from Liverpool City Schools and Sefton Schools arrived at the stadium and headed to the Reds suite where they would spend the remainder of the afternoon. After a quick introduction to the afternoon the young people went straight into an educational workshop which was conducted by Campaign Workers, James Kingett & Ben Holman, from SRtRC. The workshop made young people explore stereotypes and think critically about the way in which we stereotype. The young people engaged in thoughtful and honest conversation with their peers about the dangers of stereotyping. With suspicion building among the young people of who might be attending the Q&A it was time to introduce the panel. Sandra Tai from Liverpool City Council, Robert Brennan from Sefton Council and Thomasina Afful from Sefton Council were the first to join the panel. John Au of the Anthony Walker Foundation, a charity that was set up after the racially-motivated murder of an 18-year-old student in Huyton in 2005 also took time out of his day to attend the Q&A. Adding to the panel was long time SRtRC supporter and the North West Regional Secretary of the TUC, Lynn Collins. Up next to join the panel was former Premier League Referee, Chris Foy. To round off the panel of special guests were First Team players, Sheyi Ojo and Daniel Sturridge, who came down to the event to answer questions from the young people. Young people from each school put forward a variety of questions to the panel regarding racism. How would you stop racism? Do players suffer more racism from fans or fellow players? How does racism effect your performance? Were just a few examples of the questions that the panel were taking it in turn to answer. The current players explained to the young people what they should do if they experience racism and who they can report it to. The other panel members provided brilliant advice for the young people on how to report racism and what each person can do to tackle racism. Prizes were given out to the three best questions asked to the panel. The prize of a signed Liverpool shirt, which had generously been donated by Liverpool FC, was awarded to Jack from St Cuthberts for asking the best question on the day. 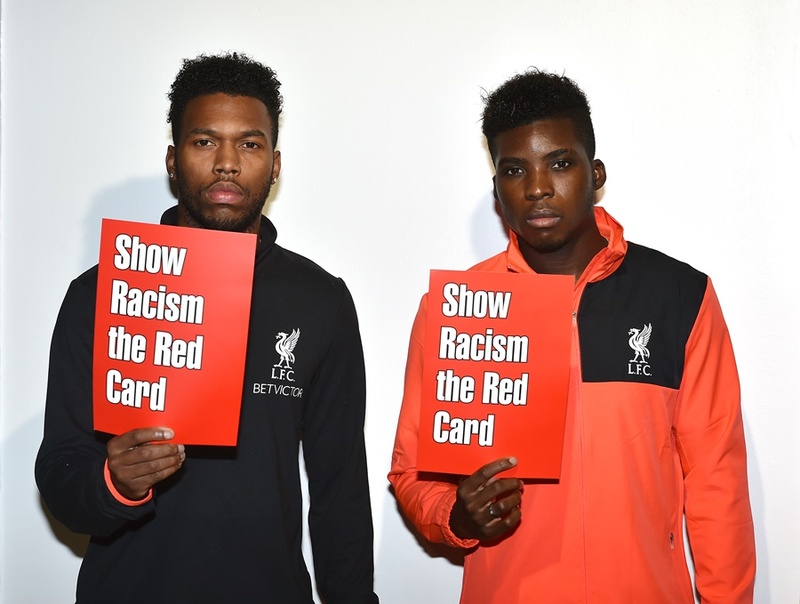 Show Racism the Red Card would like to thank everyone at Liverpool F.C for their support in organising the event and for their continued support of the campaign. A big thank you to Liverpool City Council and Sefton Counil for their continued support of the campaign and for giving SRtRC the opportunity to carry out educational work in the area. The campaign would also like to thank John Au, Lynn Collins and Chris Foy for attending the event and taking the time to sit on the panel and answer questions from the young people. The power of role-models to educate young people should never be underestimated, therefore, a massive thank you to Sheyi Ojo and Daniel Sturridge. And finally, Show Racism the Red Card would like to thank all the young people for their honest engagement from start to finish. Please see below for further coverage of the event at Anfield.